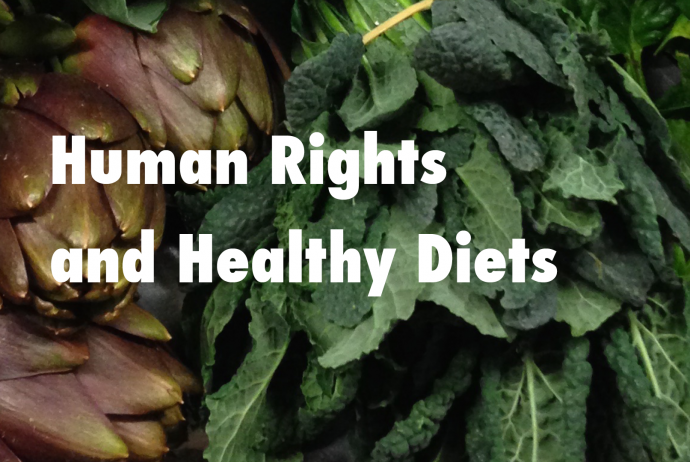 Human Rights and Healthy Diets. Does the food industry have a responsibility to respect the right to adequate food and diet-related health? Please register here by Wednesday 7 December! Human Rights and Healthy Diets on Thursday 8 December at the Norwegian Centre for Human Rights. The morning seminar is open for everyone, but requires registration. Please register here by Wednesday 7 December! The technical workshop in the afternoon is by invitation, and is intended for those with some familiarity and experience with the theme of the seminar. Read more about the workshop at the end of the page. Those who wish to participate in the workshop are invited to signal their preliminary interest by sending an email to one of the contacts listed below. Under international human rights law, everyone has a right to adequate food and to the highest attainable standard of health. States are obliged to adopt appropriate measures to respect, protect and fulfil these rights, which can be done in many ways, including public health regulations through food legislation or restrictions concerning the marketing of food. But does the food industry also have a responsibility to respect the human rights to adequate food and diet-related health? It is clear that they have a duty to comply with existing regulations in the territory of the states where they operate, but does the food industry have a responsibility for healthy diets also when existing regulations are insufficient or totally absent because of the failure of the state to provide effective regulations? cancer, diabetes 2, and cardiovascular diseases. Which obligations do governments have to protect their populations from unnecessary poor health? And what responsibility do food companies have with regards to promoting healthier diets? Businesses across the world are encouraged by governments to follow the Guidelines for Multinational Enterprises developed by the OECD. The OECD Guidelines provide guidance for responsible business conduct in a global context. They have been updated to reflect also the UN Guiding Principles on Business and Human Rights (UNGP), which were endorsed by the UN Human Rights Council in 2011.
production to consumption? How can due diligence and reporting on practices by the corporate food sector be operationalised? The seminar will especially explore the challenges to industry and governments to mitigate the accelerating global obesity epidemic among rich and poor. The challenges include both commitments to responsible food processing and ethical food marketing practices, to children in particular. What sector-specific frameworks and standards can guide reporting and necessary changes in the food business sector towards the consumer end of the spectrum? The technical workshop in the afternoon is intended for people with some pre-familiarity and experience with the theme of the seminar, be it from a legal, human rights, academic, government administration, international organisation, civil society or private sector perspective. The intention of the workshop is to discuss in more detail the issues raised in the morning session, from various angles and viewpoints of the workshop participants. The workshop further intends to explore the use of the UN Guiding Principles on Business and Human Rights and the the UNGP Framework in relation to the human rights to adequate food and diet-related health. The organisers hope the workshop can inspire proposals for due diligence by concerned companies in respect to these rights, and welcome a vivid discussion of governments’ obligations to protect these rights for optimal nutrition and absence of all forms of malnutrition and related diseases. The initiative should be of equal interest for the ongoing process in the UN towards a possible Binding Treaty on Business and Human Rights. wbeide(at)uio.medisin.uio or Anne Lene Løvhaug on annelenelovhaug(a)gmail.com, and will be informed later. Please note that space is limited for this workshop.